From left. Murray Wall, string bass; Steve Little, drums; Greg Ruggiero, guitar. Photograph by Gabriele Donati. That CD is here, and it’s called IT’S ABOUT TIME, and it’s a honey. I checked with Greg to be sure his parents wouldn’t mind seeing that in print and he wrote back, The CD release party is October 1st at Mezzrow. The folks are coming, maybe you can meet them then! The Mezzrow schedule (they’re on West Tenth Street in New York City) has tickets for sale here for the two October 1 shows; I know this because I bought some. But perhaps I’m getting ahead of myself, or of ourselves here. As a title, IT’S ABOUT TIME might refer to Greg’s parents’ two-decade long wait, but the title speaks to something fundamental about this CD, and about the music that Greg, Murray, and Steve make as a trio and on their own. “Time,” to them, is more than what someone’s Apple watch might say: it is their visceral connection with rhythm, with the deep heartbeat that we feel from the Earth and also from the Basie rhythm section. Fluid but unerring; sinuous but reliably trustworthy. They live to swing, and we can rely on how well they do it, and how well it makes us feel. Greg, Murray, and Steve are also reassuring in their love of melodies, and of melodic inprovisations. This isn’t — to go back some decades — “Easy Listening,” but it certainly is easy to listen to. The repertoire is classic; the approach melodic and emergized. GONE WITH THE WIND is light and quick, a zephyr rather than a lament. APRIL IN PARIS doesn’t lean on the Basie version, but is a series of sweet chimes: I never got the sense of “Oh, this is APRIL IN PARIS again, for the zillionth time.” Sincerity rules, without drama. Steve starts off I’LL SEE YOU IN MY DREAMS with a small explosion, heralding a romp rather than a nap, and the trades between him and the other two members later in the performance have the snap of Jo Jones. Greg’s POLKA DOTS AND MOONBEAMS is respectfully tender but it never bogs down under the weight of the hoped-for pug-nosed dream, and Murray’s solo seems so easy but is the work of a quiet master. WHERE OR WHEN asks the musical question lightly and politely, without undue seriousness but with playful trades with Steve. IF DREAMS COME TRUE is easy in its optimism, and it avoids the cliches attached to this venerable swing tune. It’s lovely to have a CD (or a gig) include a blues — some musicians shy away from them for reasons not clear to me — and this one has a strolling THINGS AIN’T WHAT THEY USED TO BE, fun in itself but also a nod to the most famous association on Steve’s vita, his time with Ellington. (Yes, he taught Bert and Ernie how to swing, but that’s another matter.) Gershwin’s LIZA, which is often played at a burning tempo, is a saunter here; DON’T BLAME ME is more cheerful than usual — perhaps this trio hasn’t been blamed for anything wicked recently? I’d believe that — and the disc closes with a just-right TANGERINE. Juicy, fruitful. Greg’s playing is a delight, mixing single-string explorations with chordal accents for variety. He doesn’t overpower the listener with Olympian slaloms on the fretboard, but plays the song as if he were speaking affectionately to us. Murray Wall is one of the great warm exponents of logical improvisation, and Steve Little’s brushwork is a swing school in itself. (You won’t miss a piano.) The result is kind to the ears, with breathing room and ease — at times I thought these tracks a series of witty dances (there is plenty of good humor in this trio, although no joke-quotes). Delightful dance music even for people like me, who spend more time in a chair than they should. In the best way, this is an old-fashioned session, with musicians who know that there is life in the Great American Songbook, and that it is spacious enough to allow them to express their personalities. But there’s a refreshing homage to the melodies, first and last, that’s often not the case with jazz recordings. You can hear substantial excerpts from the CD here, and download the music as well. You can purchase the CD here, and visit Greg’s website and Facebook page as well, all of which should provide entertainment and edification for these shortened days and longer nights. Of course, the best thing for people in the tri-state area to do would be to show up at a Greg Ruggiero gig, such as the CD release one at Mezzrow, and buy discs there. But I don’t want to tell you what to do . . . or do I? I first began listening to GOLDEN EARRINGS, a series of duets between alto saxophonist Sam and pianist Michael, a few months ago. I was entranced, yet I found it difficult to write about this delicately profound music, perhaps because I was trying to use the ordinary language of music criticism to describe phenomena that would be better analogized as moments in nature: the red-gold maple leaf I saw on the sidewalk, the blackbird eating a bit of fruit in the branches of the tree outside my window. There’s nothing strange about GOLDEN EARRINGS: it’s just that the music these two create is air-borne, resonant, full of feeling and quiet splendors. Think of quietly heartfelt conversations without words between two great artists. I grew up in Dereham, Norfolk and played the saxophone in school and also in the Norwich Students’ Jazz Orchestra. I gradually became more interested in jazz through my teenage years and went to study jazz saxophone at the Guildhall School of Music and Drama when I was 18 in 2007. Since graduating I’ve been freelancing in London and doing a fairly wide range of jazz gigs. I met Michael on my first trip to New York in 2014 although I already knew his playing from a few records. I’m a big fan of his playing: he’s incredibly tasteful and has a beautiful touch. He is melodic, swinging and really plays what he hears. I think we like a lot of the same musicians: Lester Young, Charlie Parker, musicians from the Tristano school, Hank Jones, Ahmed Jamal, Thelonious Monk. Michael is also incredibly nice, generous and encouraging. We kept in touch and we played a bit informally when he was in London a few times in 2015 on tour with Jane Monheit. I then took part in a summer school run by Jorge Rossy near Barcelona, which Michael teaches on every year alongside people like Albert ‘Tootie’ Heath, Ben Street, Chris Cheek and Peter Bernstein. So after all that I felt like I knew him quite well, and decided to ask him to do a duo recording with me. I really like playing in small combos like duos and trios, and I know Michael does too: you can have a more focused, conversational musical interaction, and I enjoy the challenge of keeping the texture varied despite the limited instrumentation. The recording process itself was fairly old school: just a few microphones in a room with a nice acoustic and a nice piano (Michael’s own The Drawing Room in Brooklyn, New York), one quick rehearsal and no edits. The repertoire is mostly slightly lesser-known tunes from the Great American Songbook and jazz canon – including compositions by Duke Ellington, Jerome Kern, Victor Young, Nat King Cole and Irving Berlin – plus there’s one original composition by me. I really enjoy digging a bit deeper and trying to find tunes to interpret which are slightly off the beaten track, and Michael is a real expert on the American Songbook in particular, so it was great to utilise his knowledge in that respect. It was fantastic to play with someone of Michael’s calibre. He’s played with people like Jane Monheit, Jimmy Scott, Peter Bernstein, Kurt Rosenwinkel and Ted Brown . . . . The music was both recorded and photographed by the eminently gifted Neal Miner — whom most of us knew as a superlative string bassist. When I received a copy of the CD (released on Jordi Pujol’s FRESH SOUND NEW TALENT label) and wanted to let you all know about it, I asked Sam if he would share his notes on the music, because they were like the music: gentle, focused, and intuitive. Like most jazz musicians of my generation, I have been introduced to this type of repertoire through listening to and playing jazz, rather than by growing up with it as pop music in the way that, say, Sonny Rollins would have done. However, I have become increasingly interested in the songs themselves. Rollins playing “If Ever I Would Leave You” is amazing, but it is also fascinating to hear the Lerner and Loewe song in its (very different) original form. (I am referring more to American Songbook songs here, rather than compositions by the likes of Charlie Parker and Duke Ellington, which have obviously always existed as jazz performances). By listening to original recordings, learning lyrics and consulting published sheet music, I have tried to access the ‘composer’s intention’ – something that Michael Kanan, an expert in this area, talks about. We tried to use this as our starting point for interpretation and improvisation, rather than existing jazz versions. I feel very fortunate to have recorded with Michael. His wonderful playing is plain to hear, but he was also incredibly generous and encouraging throughout the entire process of making this album. Our approach to recording was fairly old fashioned: just three microphones in a room with a nice piano; no headphones and no edits. Neal Miner took care of all this, and his kind and positive presence in the studio made the whole thing a lot easier. Thank you for listening to this music. I hope you enjoy it. Dancing In The Dark: Michael takes the melody while I play a countermelody partly derived from the sheet music and the dramatic orchestral arrangement that Fred Astaire and Cyd Charisse dance to in the film The Band Wagon. Cardboard: the melodies that Bird writes are incredible; he is perhaps undervalued as a composer. Michael and I solo together. Some of his lines here are so hip! Irving Berlin Waltz Medley: three beautifully simple songs. Michael plays a moving solo rendition of “Always”, which Berlin wrote as a wedding present for his wife. Hank Mobley’s Soul Station contains the classic version of “Remember”. I love that recording but the song in its original form is almost an entirely different composition. BSP: the one original composition here, this is a contrafact (a new melody written over an existing chord sequence) based on Cole Porter’s “Love For Sale”. It was written a few years ago when I was particularly interested in the music of Lennie Tristano, Lee Konitz and Warne Marsh. The melody is heard at the end. All Too Soon: originally recorded as an instrumental by the classic Blanton-Webster edition of the Ellington band, this ballad was later given lyrics by Carl Sigman. In Love In Vain: I love the original version from the film Centennial Summer. We begin with Kern’s verse and end with a coda that is sung in the film but does not appear in the sheet music I have for this. Perhaps it was added by the film’s orchestrators? So much for getting to the composer’s original intention! The Scene Is Clean: there are a few mysterious corners in this tune from the pen of Tadd Dameron, the great bebop composer, and this is probably the most harmonically dense composition to feature here. The version on Clifford Brown & Max Roach at Basin Street is fantastic. Beautiful Moons Ago: I don’t know many other Nat ‘King’ Cole originals, but this is a lovely, sad song by one of my favourite pianists and singers (co-written by Oscar Moore, the guitarist in his trio). I don’t think it is very well known. Golden Earrings: another selection from a film, this mystical, haunting song was a hit for Peggy Lee. Victor Young’s harmony is quite classical at certain points. Way Down Yonder In New Orleans: if this tune is played nowadays it tends to be by traditional jazz or Dixieland bands, but I’m a fan of it. The form is an unusual length and it contains a harmonic surprise towards the end. This take features more joint soloing and we finish by playing Lester Young’s masterful 1938 solo in unison. Michael Kanan, Neal Miner, Jordi Pujol, Walter Fischbacher, John Rogers and Mariano Gil for their invaluable help and expertise. London friends who helped by playing through the material with me before the recording, lending their ears afterwards and by offering general advice: Helena Kay, Will Arnold-Forster, Gabriel Latchin, Matt Robinson, Nick Costley-White and Rob Barron. All my teachers over the years. Special thanks to Mum and Dad, Lois and Nana. I think the listeners’ temptation is to find a box into which the vibrations can conveniently fit. Does the box say TRISTANO, KONITZ-MARSH, PRES, ROWLES-COHN? But I think we should put such boxes out for the recycling people to pick up. This music is a wonderful series of wise tender explorations by two artists so much in tune with each other and with the songs. So plain, so elegantly simple, so deeply felt, it resists categorizations. And that’s how it should be — but so rarely is. My only objection — and I am only in part facetious — is that the format of the CD encourages us to continue at a medium tempo from performance to performance. I would have been happier if this disc had been issued on five 12″ 78 discs, so that at the close of a song I or any other listener would have to get up, turn the disc over, or put the needle back to the beginning. The sounds are nearly translucent; they shimmer with feeling and intelligence. Sam’s website is here; his Facebook page here. New Yorkers have the immense privilege of seeing Michael on a fairly regular basis, and that’s one of the pleasures of living here. Posted in "Thanks A Million", Bliss!, Generosities, Ideal Places, Irreplaceable, It's All True, Jazz Titans, Pay Attention!, Swing You Cats!, The Heroes Among Us, The Real Thing, The Things We Love, Wow! I know that the tradition wasn’t exclusively female — think of Henry “Red” Allen among others — but I am holding back from making a list of all the swingers. You’ll understand. If you more evidence of Dawn’s magic — and the band’s — before proceeding, I invite you to visit here and here. She sounds wonderful, and there’s fine riffin’ that evening. To quote Chubby Jackson, but without a touch of irony, “Wasn’t that swell?” I certainly think so. Posted in "Thanks A Million", Bliss!, Generosities, Ideal Places, It's All True, Jazz Titans, Mmmmmmmmmmmmm!, Pay Attention!, Swing You Cats!, That Was Fun!, The Heroes Among Us, The Real Thing, The Things We Love, Wow! Here is the first part of a delightful Saturday afternoon of music performed at Fraunces Tavern by the Garden Party Quartet: this version being Rob Adkins, string bass; Chris Flory, guitar; Evan Arntzen, clarinet, alto saxophone, vocal; Dan Block, clarinet, tenor saxophone, on May 7, 2016. Four more delicious performances follow below. People who fear jazz — it makes them skittish — often say that they can’t recognize the melody. For them (and for us) here are four standards, played and sung with loving swinging reverence by this melodic quartet. You’ll hear the work of Hoagy Carmichael, Sidney Arodin; Alex Hill, Bob Williams, Claude Hopkins; Cole Porter; Harold Arlen, Ted Koehler. And I daresay that the composers and lyricists would be pleased with the results. You decide. Yes. The real thing. The good stuff. Out there in public, too. 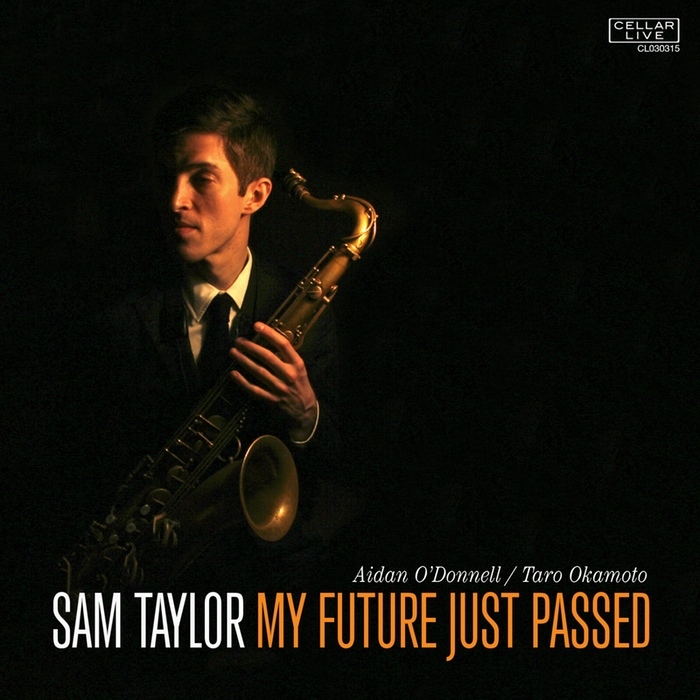 Possibly you haven’t yet heard of the tenor saxophonist Sam Taylor. But I guarantee you will. He has a rare gift. When I was opening the plastic wrapping enclosing Sam’s debut CD, I confess I was expecting more-of-the-same: in this century, many young musicians are technically gifted in ways that would astonish the Ancestors. There isn’t anything they can’t play. Complex harmonies at top speed, chorus after chorus, are their basic vocabulary. They often make Bird sound like Honore Dutrey. They have spent their youth practicing, and it shows. And that in itself is a wonderful accomplishment — if technique is your primary goal. But often it is cold — music that doesn’t ring in the listeners’ hearts. I knew Sam Taylor had a good chance of being different — of reaching our hearts — when I saw the song he had chosen as the title of his CD, a beautiful obscure 1930 song. Not an original, although full of original sentiment. I know that the lyrics of the verse (George Marion, Jr.) suggest a certain light-heartedness (rhyming “not less” and “spotless” but the melody is haunting, especially the bridge — thanks to Richard Whiting. Beautiful — and I admire her willingness to take her time, to let the song unfold. You can find out more about Sam Taylor here, and you can also download the CD. Of course you should search out Sam at a gig and buy a copy directly, but it can also be ordered from CellarLive.com. It will soon be available on Amazon as well. Sometimes, a song enters our life at the perfect moment. It gives clarity and meaning to seemingly random events. It speaks and gives voice to our feelings of love, heartache, joy and jubilation. It taps into our memories, both personal and collective, taking root in our hearts, stirring our imagination. The songs reflect Sam’s love for lasting melodies: LOVE ME OR LEAVE ME / MY FUTURE JUST PASSED / DO SOMETHING (based on a Cole Porter melody) / SHE’S FUNNY THAT WAY / WHY DON’T I / MEAN TO ME / ERONEL / YOU ARE TOO BEAUTIFUL / T.O.’S BLUES. I am certain you will welcome him as someone not afraid to create beauty. Rebecca Kilgore doesn’t come to New York as often as I would like, so her September 2014 visit was a real pleasure. Fortunately, I am able to share some of that pleasure with you, with four performances from her gig at the wonderful new jazz room Mezzrow (at 163 West 10th Street, New York — phone 646.476.4346). Becky had imaginative support from Ehud Asherie, piano, and Joel Forbes, acoustic unamplified string bass. And her delicate floating emotional intelligence gleams even more brightly in the evocative darkness. See what you think in these four performances: one asking a favor of the cosmos; one sweetly astonished at the power of love requited; one ebullient and joyous; one optimistically cheerful. All four are, to me, delicately embroidered masterpieces that — by the way — swing no matter what the tempo. We’re “on a rainbow rafter” with this wonderful trio. And just in case you’ve missed Becky’s recent triumph — recorded one day earlier at the Allegheny Jazz Party, en francais, here it is.